From the time they leap out of bed until they hug each other good night, two rambunctious young monsters make the world their playground. And playtime between such great friends is colossal fun, and sometimes earth shaking business. 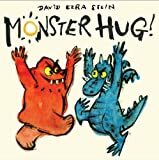 David Ezra Stein?s simple, descriptive text and lively illustrations are full of humor, playing with size and perspective as the monsters play familiar games on an enormous scale. Children will delight in the monsters? antics, and get a kick out of the twist at the end of the story?the monsters might be as tall as mountains, but they?re just kids, after all!